Migrating Sandhill Cranes at a stop-over site at the Hiwassee Wildlife Refuge in Tennessee. Sandhill Cranes are some of the largest birds in Tennessee, standing over 4 feet tall with a wingspan of more than 6 feet! Each year, thousands of Sandhill Cranes migrate through or spend the winter on and around the Hiwassee Refuge in Birchwood, TN. 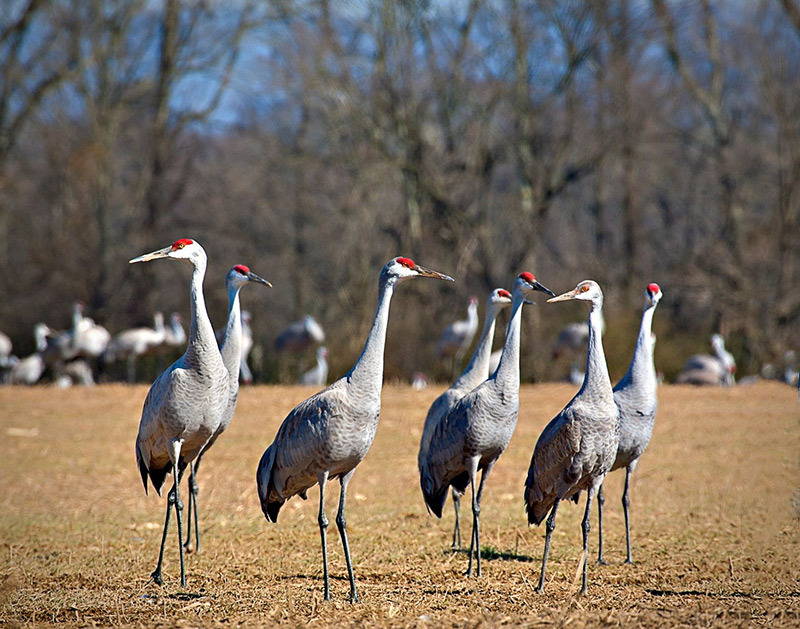 On Jan. 19-20, 2019 the annual Tennessee Sandhill Crane Festival was held to celebrate the arrival of these magnificent birds, and also to call attention to the wildlife in Tennessee and the Native American history of the area. 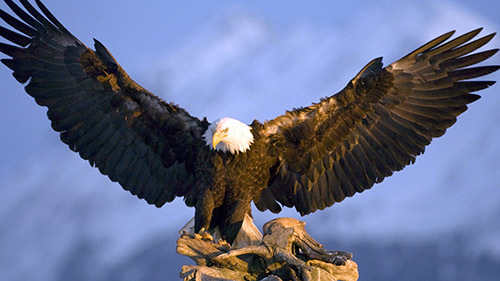 Since 2011, the American Eagle Foundation has presented an always-popular live raptor show each day of the festival. This year Avian Care Specialist Carly Hamilton and Wings of America Stage Manager Beth Parker brought ten birds to the event: Gimli & Tyson (Screech Owls), Jagger (Harris Hawk), Dezzi (Desert Eagle Owl), Leia (Peregrine Falcon), George (Turkey Vulture), Buzz (Black Vulture), Jesse (Red-tailed Hawk), Tecumseh (Golden Eagle), and America (Bald Eagle). 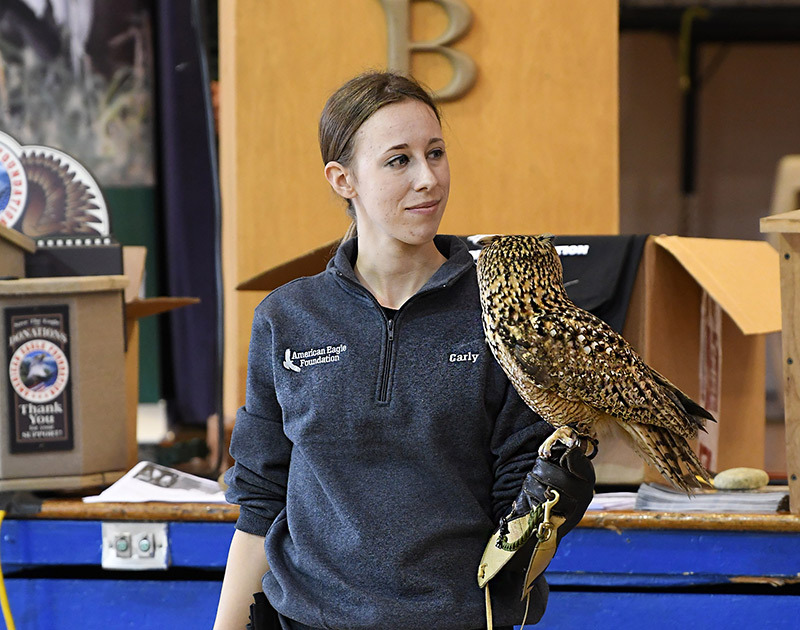 Avian Care Specialist Carly Hamilton holds Dezzi, a Desert Eagle Owl. It is found in the wild in the Middle East, living in rocky desert hills, mountains and cliffs. Its mottled coloration provides excellent camouflage. Photo: Clay Thurston. 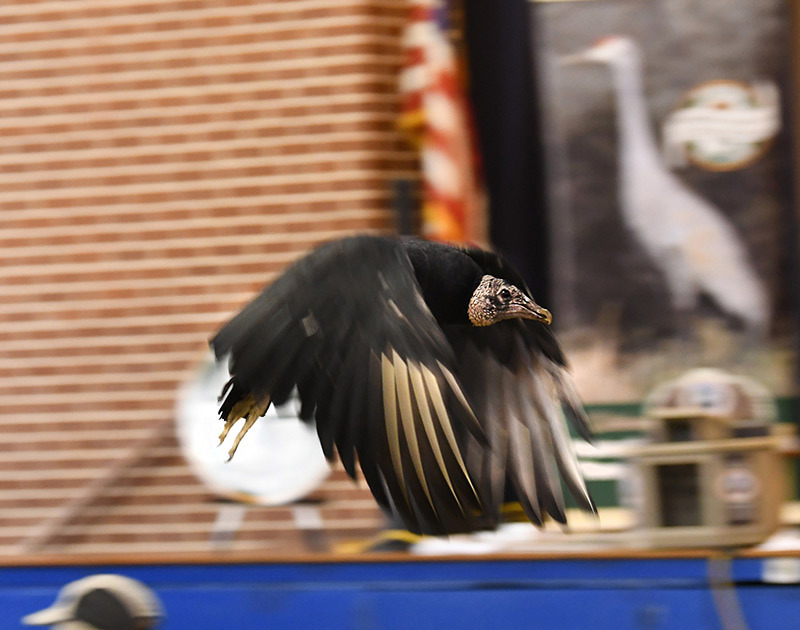 Buzz, a Black Vulture, showed off her powers of flight, and she performed 15 glove-to-glove flights over the audience for both shows! Photo: Clay Thurston. 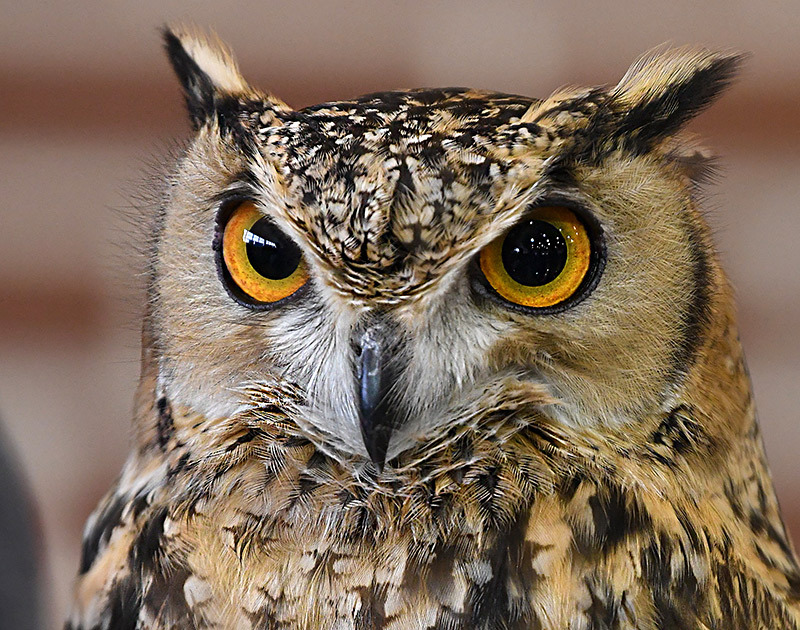 Dezzi, a Desert Eagle Owl, is a human imprint and cannot be released into the wild. He is an educational ambassador and performs in AEF's Wings of America Birds of Prey show. Photo: Clay Thurston. Jagger, a Harris Hawk, was hatched in captivity and hand-raised, making him a human imprint. Harris Hawks are very social birds, and Jagger has a sweet disposition. Often called Wolves of the Sky, they hunt in packs to take down larger prey. Photo: Clay Thurston. 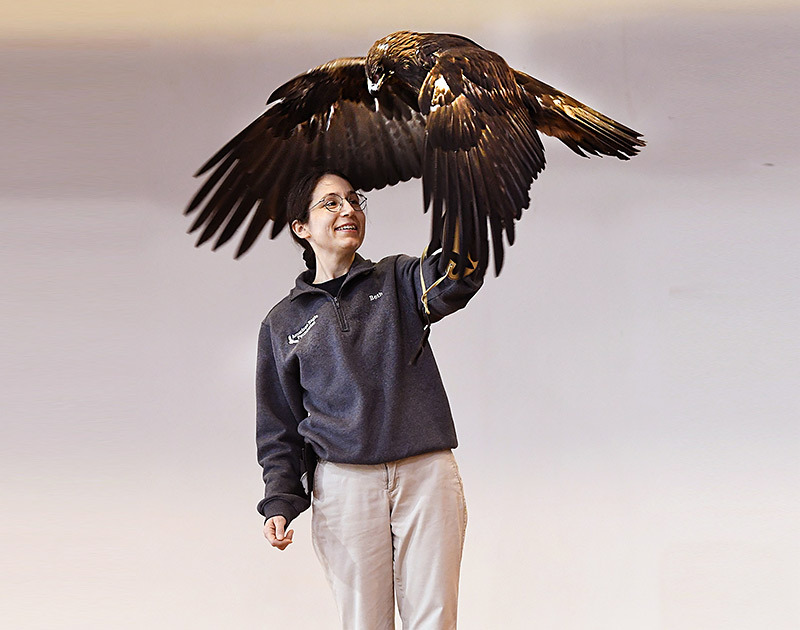 Beth Parker, Wings of America Stage Mgr., holds Golden Eagle Tecumseh, who came to AEF in 1995 and is a star at the Wings of America Birds of Prey Show. Photo: Clay Thurston. In addition to AEF’s program, the festival had presentations by TWRA naturalists and experts, live music, vendors selling art and photography, crafts for kids, and opportunities to go out and view the migrating cranes. Attendance for our program was impressive! We had close to 200 people of all ages each day. During our program, we talked about the mission of the AEF, introduced the birds and shared their stories. We also discussed conservation issues, such as the vulture extinction crisis in Africa and Asia, the issues behind lead poisoning in Golden Eagles, and the effects of DDT on Bald Eagles and Peregrines. Buzz even got the opportunity to show off her powers of flight, and she performed 15 glove-to-glove flights over the audience for both shows! Buzz also showed off her adorable walking and running, following Carly up and down the aisles. On Sunday, Beth and Carly had the opportunity to record information about AEF, Challenger, and AEF’s Wings of America show for a podcast/broadcast segment to be aired on Tennessee WildCast. 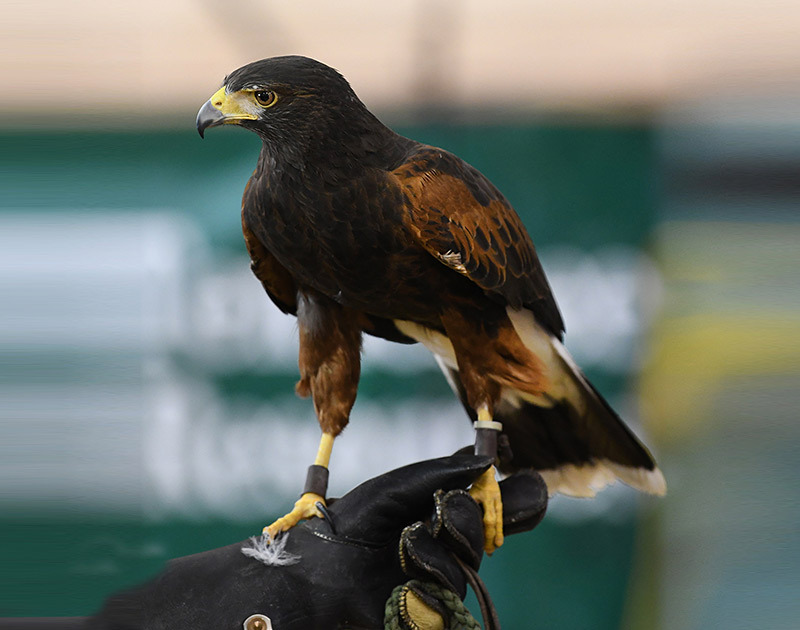 Jagger, our Harris Hawk, was introduced as a “special guest” when his quiet voice could be heard during the recording. All of the birds did well, both travelling in the van, and staying overnight. America, our Bald Eagle, sat out on a ground perch several hours and fell asleep! It was a fun trip for the handlers, and (hopefully!) for the birds, too!